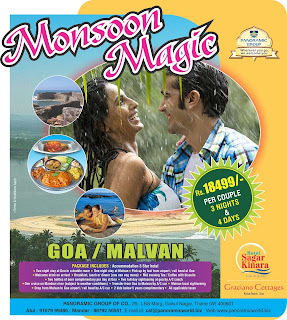 In its trend to offer incredible Holiday packages Panoramic Group is offering unbelievable Monsoon Magic Holiday packages for Goa and Malvan, especially for couples. You can explore world famous Goa beaches and the serene beaches at Malvan at an unbeatable prize. These are holiday packages for couples and two children under the age of five years. Do not miss this great chance to enjoy the most popular destinations Goa and Malvan at rock bottom prizes. 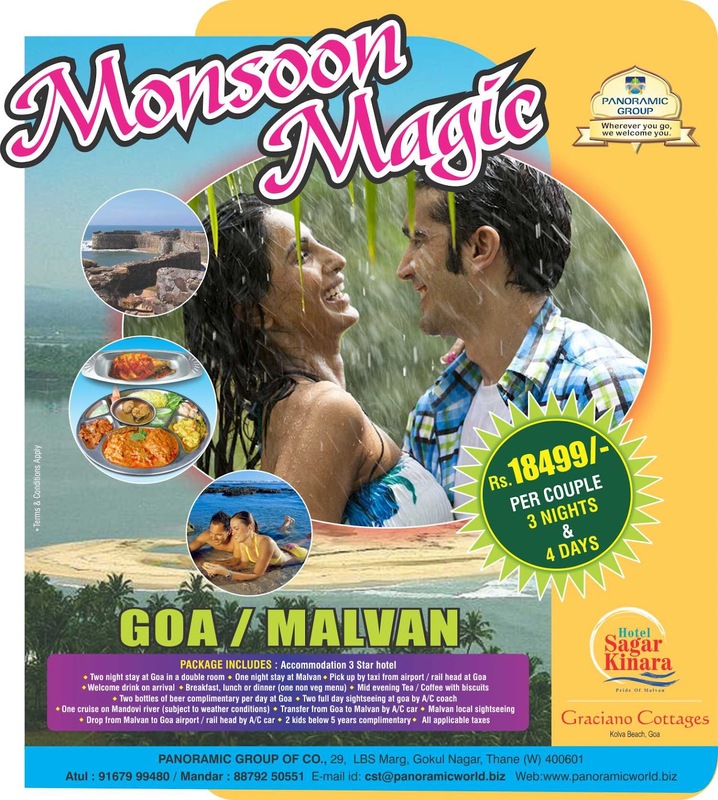 For enjoying the exclusive monsoon breeze at the Malvan beach you can avail one of the much economical Monsoon Holiday packages. The first Goa/Malvan package at Rs 18499/- per couple is for 3 nights and 4 Days. It will include two nights stay at Goa and one night stay at Malvan. Pick up by taxi will be available from airport or railway station at Goa. The package also include welcome drink, breakfast, lunch or dinner and mid evening tea/coffee. We will provide two bottles of beer per day complimentary at Goa hotel. You can enjoy two full days sight seeing by A/C Coach in Goa. If weather permits you can also enjoy cruise on Mandavi River. To travel from Goa to Malvan, drop from Malvan to Goa airport or railway station and sightseeing at Malvan will be by A/C car. The second Goa/Malvan package is at Rs 8499/- per couple for 3 nights and 4 days. It includes 2 nights stay at Goa in a double bed room accommodation and one night stay at Malvan in our hotel. You will be served a welcome drink, breakfast, lunch or dinner and mid evening tea/coffee. Experience the undulating rain showers and the blissful surroundings in these Goa and Malvan holidays. Have a great time at Sagar Kinara in Malvan near the historical Sindhudurg fort. 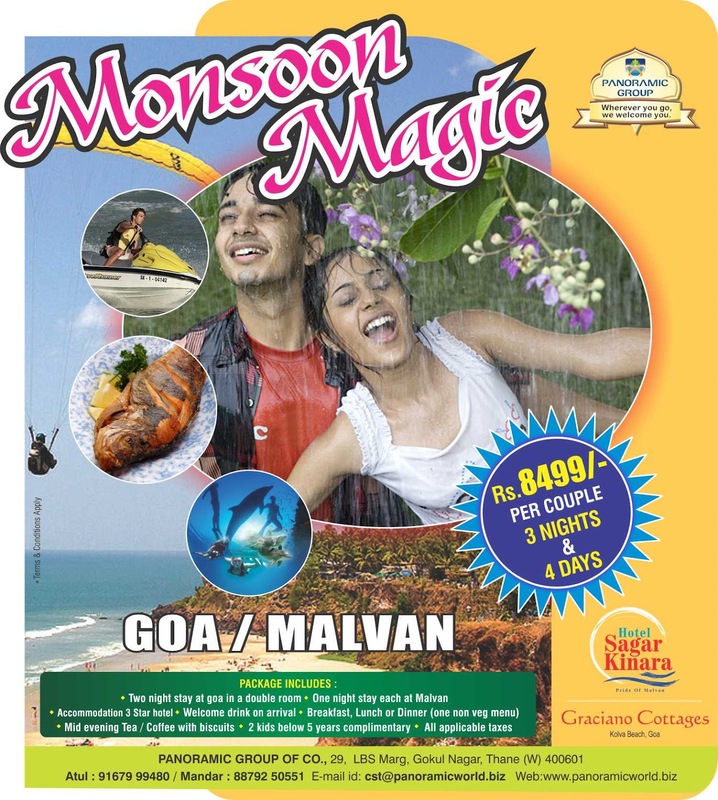 Visit the beaches while it is raining and get the exclusive views of the Malvan coast and its surroundings. Many tourists visit Goa during the rainy season for enjoying the unique experience to stroll the Colva beach under rainy showers. You can also enjoy Goan and Malvani food delicacies at these destinations. 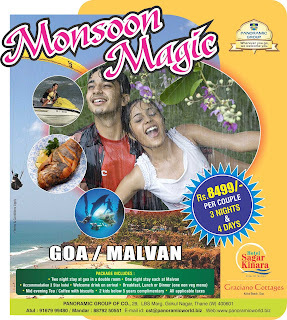 We assure that you will enjoy great time and relaxation during this Monsoon package to Goa and Malvan. The package cost is all inclusive of taxes.